On May 30th, in partnership with Evergreen Cityworks we put on Better Budget Day 2015: A Civic Engagement Workshop. You can check out photos of the day here, and catch up on the social media action here. 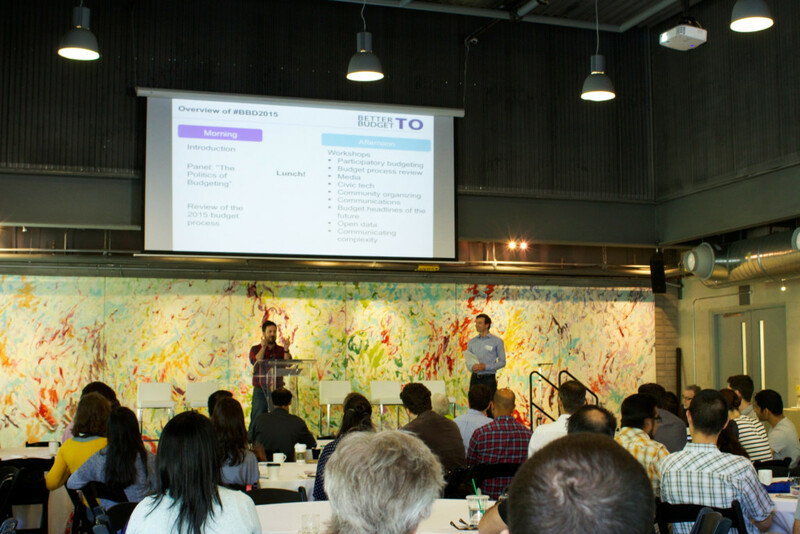 The event took place at Evergreen Brick Works, and over 120 people were in attendance. In addition to releasing our review of the 2015 Budget process, we facilitated a panel discussion on the Politics of Budgeting with London City Councillor Jesse Helmer, Toronto City Councillor Gord Perks and former City of Toronto Budget Chief Michael Del Grande. After breaking for lunch attendees had the opportunity to participate in 2 workshops. We’ve included a description of the workshops below. You can also click through to see some of the presentations and outputs that came from some of these interactive workshops facilitated by industry experts. If you’d like to view out presentation of our review of the 2015 budget process, click here. Participatory budgeting allows communities to propose local projects, and then vote on which to fund with city dollars. Used around the world, “PB” has finally come to TO. Learn about the three ongoing PB pilots and have your say on the key success factors and whether they can be scaled city-wide. Late last year, the brand new Budget Committee approved a motion to develop a “comprehensive community consultation process… for the multi-year 2016, 2017 and 2018 budgets.” As the City gets started with this exciting work, help develop advice for councillors and city staff on what this new community consultation process should look like. The media plays an important role in creating public awareness of the budget, and in both setting the political narrative and reporting on the facts and figures. Led by a leading local journalist, this workshop asks: How are TO media outlets doing in their coverage of the budget? And how can budget coverage be improved? Online tools offer the potential to reach vastly more citizens than the old-fashioned budget town hall. Cool new apps, budget simulators and dashboards are in use in many cities. This session will look at the different types of civic tech tools and ask: what’s needed in TO and how do we build it? Budgets are about setting priorities at 30,000 feet, and then flowing the dollars to programs and services that touch people on the ground. Yet, citizens often feel left out of the process. Community groups across TO can play a critical role in engaging citizens around budget issues and building budget literacy. But what tools and supports do they need to do this effectively? What would decisions linked to long-term priorities and based on evidence look like? Or, a budget process that better reflects public participation and engagement? This fun, interactive workshop will have participants present their vision of what success looks like by designing the cover of a local newspaper on the day after the 2018 City budget is approved. The City has made great strides with its Open Data initiative, but there are huge opportunities to open up budgeting and financial data. This session will explore how budget and financial data is managed internally by the City, what data is currently released, and what other data could be released (in timely ways) as part of improving the budget process. From property tax assessment and rate-based services to 10-year capital plans, budgets are full of complexity. This session asks: how do you communicate the complex ideas and information in a budget? And what are some simple things we can do to help citizens the technical terms and all the numbers?